DeFelsko’s PosiTector 6000 coating thickness gage is ideal for measuring crucial dimensions on offset printing equipment. It provides quick and easy blanket, packing and plate thickness measurements to ensure good print quality and lower maintenance costs. 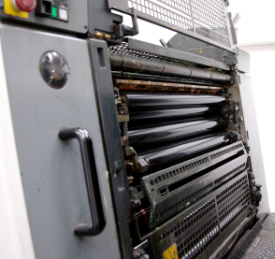 Offset printing is a common printing technique in which an inked image is transferred or “offset” from a metal plate on a rotating cylinder to another cylinder covered with a rubber blanket. The image is then transferred from the blanket to a printing surface. This technique is used to print on paper, decorative board, newspapers, magazines, business forms, envelopes, paper board boxes, cards, stamps, plastic cups, and decorated metal. The effective transfer of an image from the metal plate to the blanket requires consistent pressure or “squeeze” at the point of contact between the metal- and blanket-covered cylinders. This is accomplished by adding an extra thickness of packing material (e.g., paper or fiber) below the blanket to ensure the blanket extends above its cylinder. This forces the blanket against the metal plate cylinder at the point of contact. Another way to think of this is that the packing ensures an overlap of the cylinder radii so that the cylinders are always pushing against each other where they contact. This extra thickness or overlap – called the squeeze – is typically 0.004 to 0.006 in. (4-6 mils or 0.1-0.2 mm). It is crucial to print quality. If the squeeze is too low, the image will not transfer effectively, and if it is too high the printing dots can slur or smear. While in operation, the printing blanket and the packing material beneath it are subjected to constant compression that gradually reduces the thickness of both layers. Therefore, the critical squeeze dimension must be periodically monitored to ensure effective print quality. 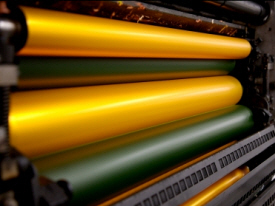 The rubber blankets generally last from 3 to 6 months, depending on the type of press and the nature of the print jobs. Blanket thickness must also be measured regularly to achieve consistent print quality and to determine when the blankets should be replaced. Conventional analog-type “needle” instruments have traditionally been used to measure on-press blanket/packing thickness. Two needles penetrate the printing blanket and make electrical contact with the metal surface of the cylinder below the packing. Unfortunately, piercing the blanket can cause damage and affect the printing quality. Chemical solvents can seep through the puncture holes and lead to spots of swollen packing materials below the blanket, with consequent smearing of the image. As it relies on magnetic or eddy current principles, it is non-destructive and leaves no puncture holes in the blanket. The gage can be used over the entire cylinder width. 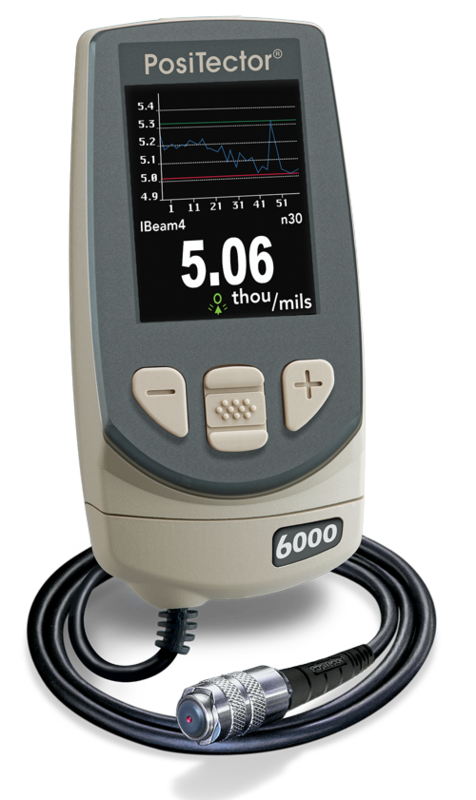 Repeated measurements can be taken regularly and easily, and the built in statistics program can continuously update and display average readings across the surface. Probes available for a variety of applications including microprobes for hard-to-reach areas. The PosiTector 6000 FTS probe should be used to determine the thickness of blanket, packing and plate materials while on a steel press cylinder. If the press cylinder is made of stainless steel or aluminum, the FNTS probe should be used. These interchangeable probes can measure thicknesses from 0 to 250 mil (6 mm) with a maximum accuracy of ± 0.5 mil (0.01 mm) + 1% of reading. The memory and downloading capabilities of the PosiTector 6000 allow an operator to track blanket/packing compression and wear over long periods and to record how they are affected by different print runs and operations. Through experimentation, one can use PosiTector 6000 measurements to optimize the printing conditions and better forecast when blankets will need to be changed. For current pricing or to order these instruments, please visit our Sales page. If you require additional technical information or have questions relating to your particular application, we encourage you to take advantage of our years of experience in recommending the best gage for your needs. We would like to thank Mike Gallagher of SunShine Paper of Aurora, Colorado (www.sunshinepaper.com) for his assistance with the research for this article.